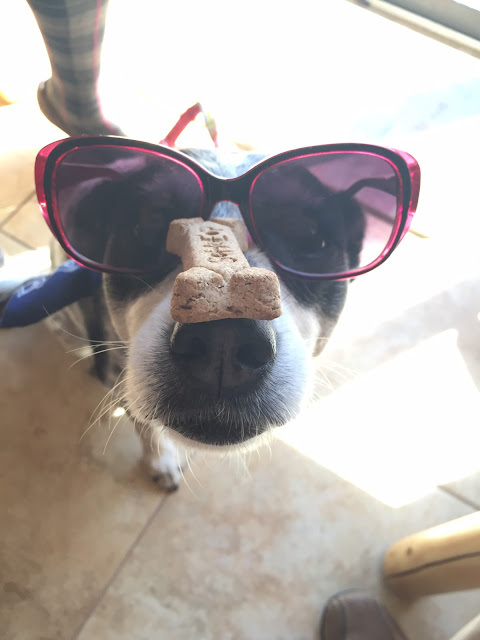 I know I have talked a little bit about our dog on the blog before but today I wanted to share a little history about our dog and some funny things about her. First, you must know how Dave got our dog. One day, Dave was at a car repair shop and a stray dog (our dog now) had come into the shop. The guys there were going to use her as target practice. How rude and awful is that??? Dave said he would take her home and see how she was. He said if she was a terrible dog that he would take her to the Humane Society. Dave took her home and on the first day there she learned how to sit. That was in 2004 and here we are 12 years later and she is the best dog ever. Dave and his sister equally shared this dog when they lived with their Mom. However, when they both moved out of the house, instead of just one person owning her they decided to do a split custody with her. Becky, Dave's sister, gets her one week and we get her the other week. Dave and I call her Static and Becky calls her Callie. She responds great to both names. When I first started dating Dave I liked Static but after I married Dave and we had Static longer I loved her! She is a good companion and is super obedient. Static's biggest flaw is that she loves to poop in public. Seriously! It is so embarrassing. When we are in public she doesn't go in secret. She waits until there are people and cars around and then she goes. That is when I slowly walk away, look at Dave and say, "She is your dog." ha! Static is around 14 years old and she still runs and is really active. Oh, and she is a Blue Heeler / Whippet mix. She loves to travel and camp with us. Really, she just loves to go anywhere with us. She is a lot of fun. I have never met someone who didn't like her and she gets along with kids really well too. And now I must tell you about Dave's new adventure with Static called - The Balance Series. 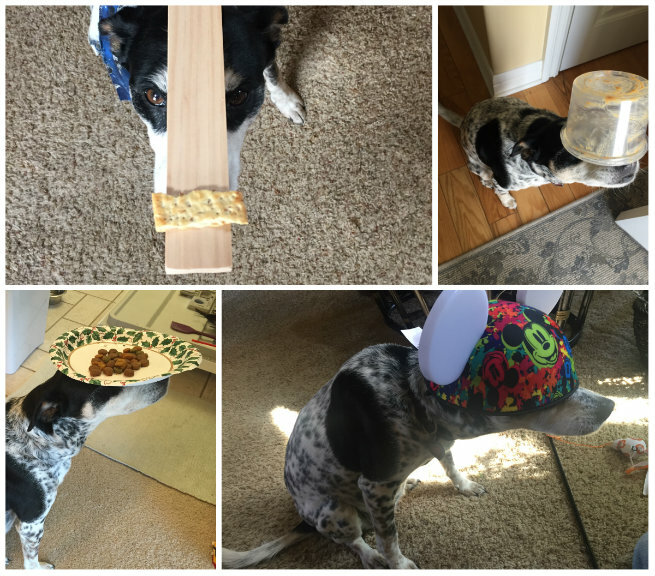 The balance series is where Dave puts random things on Static's nose and tells her to wait, snaps a picture and then gives her a treat. 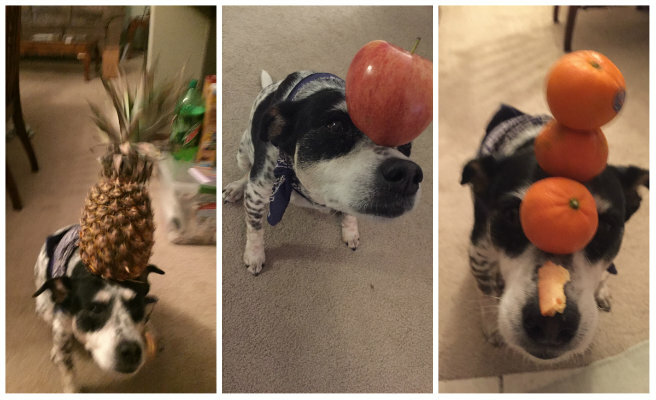 Usually she gets to eat something she balanced, unless it's a pineapple or something she hates. Sometimes I feel bad for her but she gets a treat out of the deal and she is pretty tolerant and obedient and really, it's hilarious! Dave and I probably have too much fun with it. What kind of pet do you have? What tricks does your pet do? If you don't have a pet what would you get? 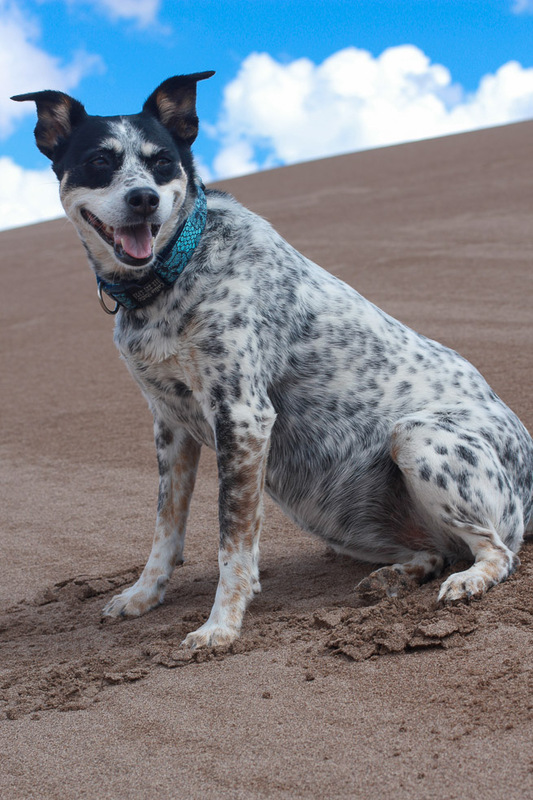 I love my blue heeler! Static looks to be pretty precious as well! aww hey static! i can't believe they were going to use her as target practice...people are so mean to animals! it makes my heart hurt. so glad Dave rescued her! and yay! can't wait to hear about Quack! We have 2 cats, and they're definitely not this cool! Do you still share her with Dave's sister? Haha the balance series!!!!! Awesomeness. And aww, she sounds like such a sweet doggie and good companion. Seriously- cutest dog ever!! Haha I so wish our building allowed pets! Oh my goodness, what a good dog! I can't believe all those things she can balance! 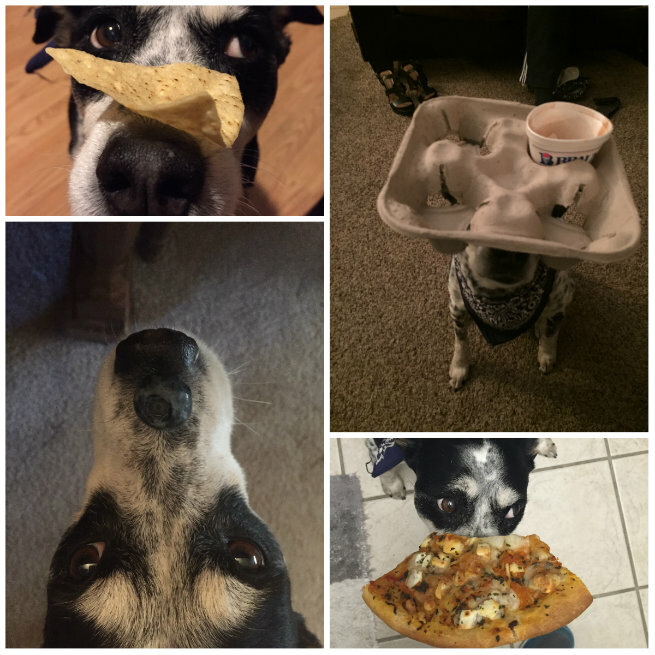 I've seen several dogs who will wait for a treat on their nose, but those pics are pretty extreme (in an awesome way)! Go Static! I am jealous with Static, I love how he behave in the car. Static is so cute. It looks life he fun to be with for an adventure.